In short, that means a large lounge area with adjustable seating arrangements, multiple sun-beds, outdoor cuisine, gyro stabilization, XXL stowage for gear and toys and an impressive amount of deck space which provides an overwhelming freedom of movement. Packaged in contemporary Scandinavian design. “We are seeing a clear trend in boat usage right now which is characterized by more effective utilization over shorter periods of time. This often corresponds to day trips or weekend getaways with an overnight stay where boat users can relax and have a good time together with their family or friends. The new T11 is designed to meet these needs in full. It offers multiple opportunities for socializing, relaxation and activities onboard. There is space for four people to stay overnight in two spacious berths and the boat has been consciously packed with functional features for a superbly comfortable life at sea” says Jonas Göthberg, commercial manager of Nimbus Boats Sweden AB. ”Our customers feel that we have really done our utmost to design the boat in a thoroughly considered way that makes it easy to use no matter your chosen activity. 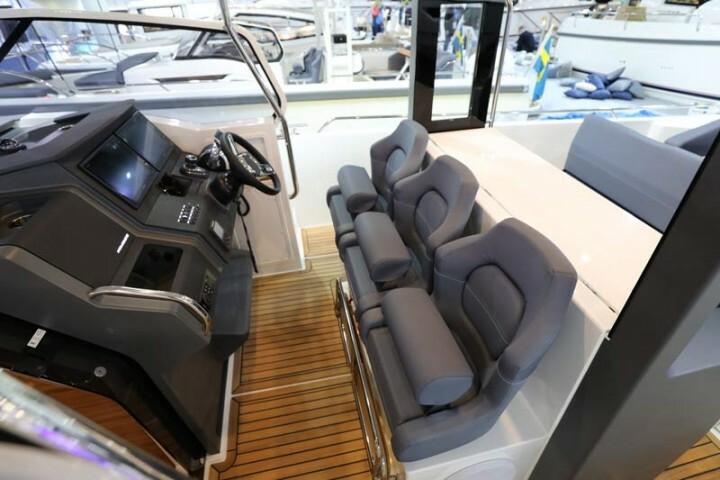 In addition, they also appreciate its excellent sense of ‘seamanship’ which gives an added feeling of comfort and security onboard” says Joacim Gustavsson, Chief Designer at Nimbus. 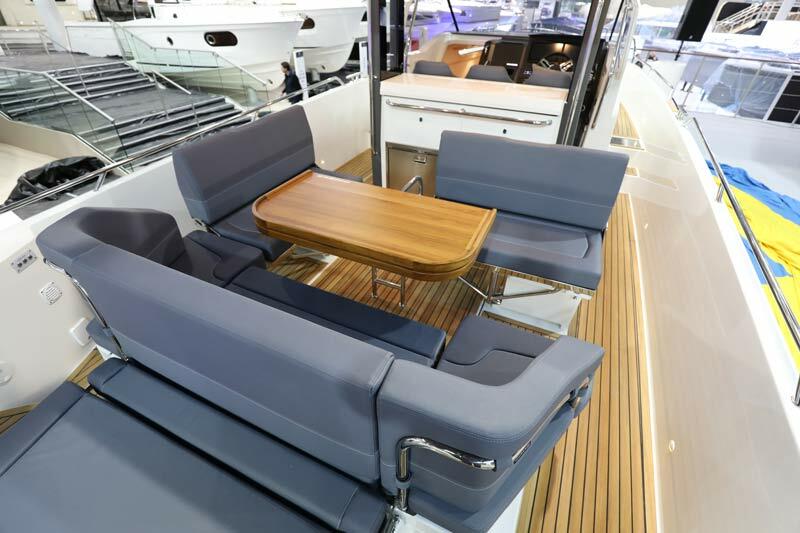 The longue area has three sofas and a large table which, depending on its position, can function as a sun deck or a seating area that can either have all seats facing the direction of travel or alternatively facing one another. The outdoor kitchen has drawers for cutlery and tableware, a kitchen sink with hot water and space for a gas stove or electric grill. 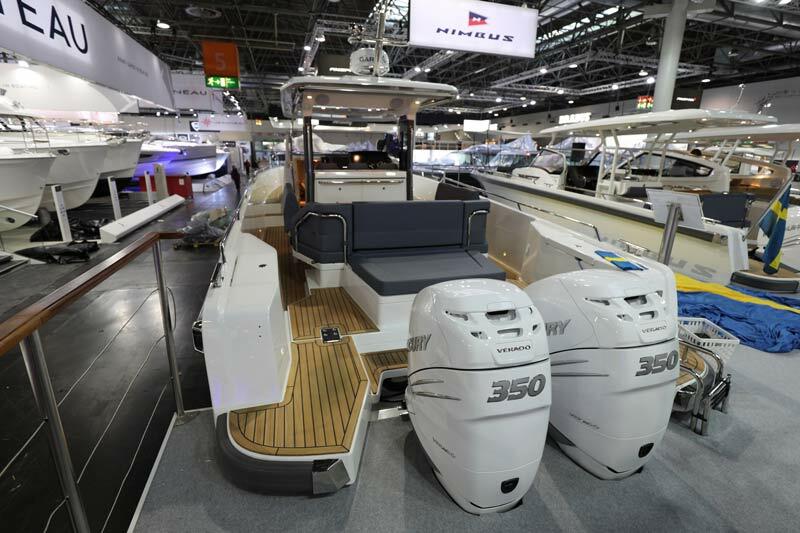 The large stowage space measures just over 2500 liters and boasts a hydraulic opening mechanism that is easily accessible from the after-deck. It has space for everything you could ever want to bring with you, whether that be SUPs, sea bobs, wakeboards and biscuits or simply an inflatable rubber boat. The bathing platform and the after-deck are ample and easily provide enough space for several people at the same time. “We already added some extra deck space, treading surfaces and wide passageways on this boat’s little sister, the T9, but the T11 takes things to a whole new level. The surface areas are exceptionally generous and the freedom of movement you get onboard is palpable – not just in the lounge area, but on the after-deck and the foredeck as well. The boat is far from being over-furnished and freedom of movement is something that you truly feel whenever you step onboard” says Joacim Gustavsson. Who is the T11 for? The Nimbus T11 is a spacious and adaptable day boat for great days in fantastic company. It is a boat which values seaworthiness, smart functionality, user-friendliness and a careful, contemporary Scandinavian design. 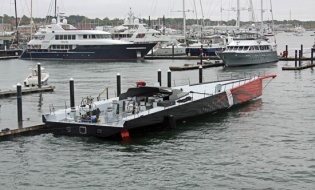 Hodgdon Yachts announced the successful infusion of a 100ft carbon fibre hull mould.